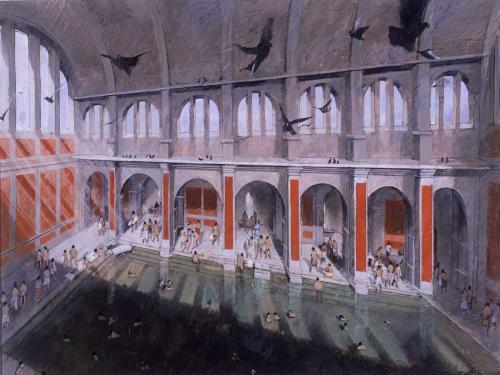 The large Roman bathing complex at Aquae Sulis was designed to cater to the needs of both local people and those who travelled as pilgrims from across the Empire. The baths at Bath were unusual not just for their size, but also for the fact that they used so much hot water. Roman bathing was based around the practice of moving through a series of heated rooms culminating in a cold plunge at the end. This sequence might include an opportunity to luxuriate in a hot tub or a small bath of hot water in the caldarium, but it did not normally involve swimming around in a great hot swimming pool such as the Great Bath. The Great Bath was the centre piece of the Roman bathing establishment. It was fed with hot water directly from the Sacred Spring and provided a luxurious warm swim. The bath is lined with 45 thick sheets of lead and is 1.6 metres deep. Access is by four steep steps that entirely surround it. Originally roofed with a pitched timber construction, this was replaced in the 2nd century with a much heavier ceramic vault that required strengthened pillars to support it. The result was that the original slender pillars were thickened and projected into the bath itself. The eastern range of the bath house contained a large tepid bath fed by water that flowed through a pipe from the Great Bath. A series of heated rooms were developed here which became progressively larger until the site reached its maximum extent in the fourth century AD. An unusual feature of the Roman Baths is this special heated room known as a laconicum. It was a small room of intense dry heat, although it could have been turned into a steam room by splashing water about. Either way you would have quickly broken out in a profuse sweat if you stayed here for more than a minute or two. You would then be ready to receive treatment with oil and a strigil to make you invigoratingly clean. A cold plunge bath was a feature of many Roman bath houses, but rarely on this scale! Here you could take an invigorating plunge after treatments in the warm and hot rooms. The bath is 1.6 metres deep and on one side has an underwater plinth on which a water feature, probably a fountain, once stood. The western range of the bath house contained a series of heated rooms and plunge pools. The development of suites of heated rooms at both the western and eastern ends of the site may have allowed simultaneous use of the site by both men and women, but maintained a seemly separation of facilities for them. The West Baths contains an exceptionally well preserved set of pilae which were piles of tiles through which hot air circulated to heat the floor and walls of the room above.